Will the Rocket Truck Fly for the Rocket City Rednecks? Find out Thursday! I am excited about being invited on the Rocket City Rednecks (RCRN) episode that will air this Thursday night at 9 pm EST on the National Geographic Channel. Travis Taylor called me back in the summer and asked me if I wanted to help them on a very special project related to moving a HUMVEE out of a dangerous situation by using a hybrid rocket engine. This sounded very interesting. If anyone knows much about me, they know that I love to push anything with a rocket engine/motor. The cool thing about doing ground vehicles is that you are not constrained by low safety margins and high performance criteria like is the case for vertical launch systems. The other cool thing that I find appealing is that man- or woman-driven rocket-powered vehicles allow people/friends to see how cool rockets can be up close and personal. This experience does not require them to go to a launch at the Cape in Florida and does not require that I get an FAA waiver. I was inspired to build my first rocket bike by Glen May, who loved the idea of experiencing rocket-powered anything. He wanted to see barnstorming as a way to get people excited again about space travel and rocketry at a very grass roots level. Glen’s passion would drive him to help Hal5 with our amateur space shot on SL2. That was a balloon launched rocket. Glen gave much work vacation to be part of our team in Huntsville. He later would follow me to Mojave to do critical technician work on SpaceShipOne. He and I were roommates and had a blast while I served as Lead Propulsion Engineer. He knew what it was like for me to manage two propulsion companies for the fuel and injector for SS1. He likened it to me “herding cats”! That was a great analogy. We lost Glen during a cold flow nitrous test at Scaled in 2007. This was a sad passing. Glen was a great guy with a great passion for space. I want to dedicate this “Hybrid Rocket Truck Build” to Glen May and all the guys from Orion who helped make it happen. There were those behind the scenes, too! Many volunteers. Nothing complex and dynamic can happen on a large scale without a great team! I want to thank the team! You know who you are. 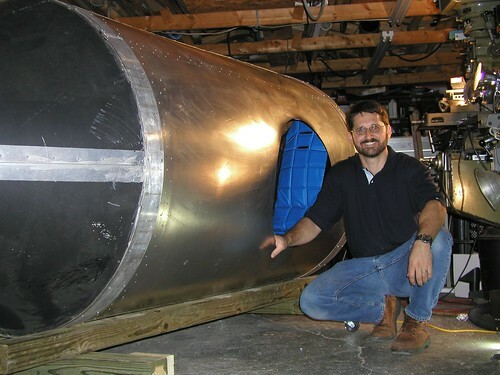 Thanks to Don Miller and the Miltec Team for providing the seed money to build this rocket motor back in 2006 when Orion was just getting started. 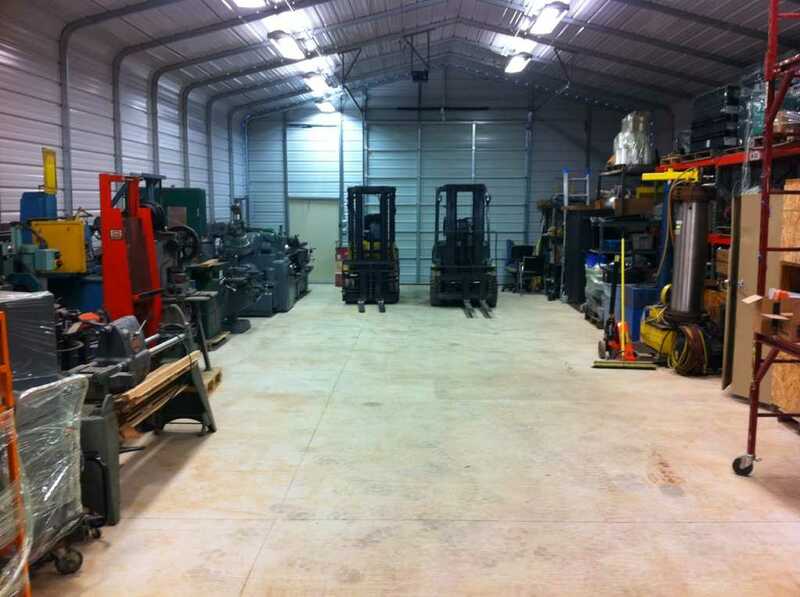 Here’s a photo tour of the Man Cave’s workshop annex. It’s not a garage because we don’t park in here. HAL5 was formed in 1983 by a good friend of mine, Gregory H. Allison, former executive vice president of the NSS and chair of the 1993 International Space Development Conference (ISDC). Greg worked hard to get a local NSS chapter going with encouragement from several of Dr. Wernher von Braun’s team members, particularly Konrad Dannenberg. HAL5 is a grassroots, space education, and advocacy organization whose members share the enthusiasm that space development can stimulate our world with immeasurable benefits in the areas of education, energy, environment, industry, resources, and ultimately room to grow for our society. 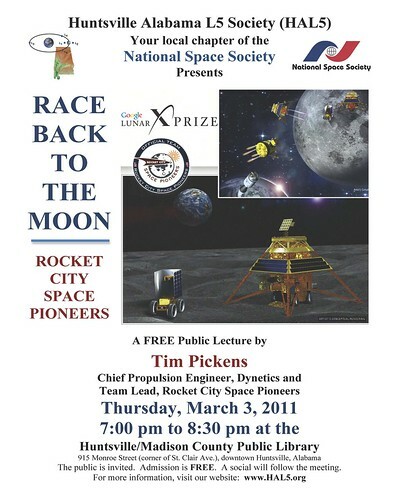 Over the past 25 years, HAL5 has sponsored numerous educational projects and activities in Huntsville and hosted a continuing series of public lectures, forums and events on topics related to space at the U.S. Space & Rocket Center and the Huntsville Public Library. Topics have included the International Space Station, space science, launch vehicles, planetary defense, and public and private efforts to achieve affordable space access. I first joined HAL5 after attending a meeting at the Huntsville Public Library in late 1993. It was then that I learned this local chapter had some really cool ideas and people as members that I resonated with. The group had just finished up the most successful ISDC in NSS history, and it had happened in Huntsville. Now they are doing it again in 2011. Profits from their hard work running ISDC was what allowed some really cool history to begin in Huntsville with an Amateur Space Shot attempt that would reach 36 miles in 2006. I was honored to be the Team Lead on this historic low-budget rocket project. I signed up in 1994, and we poured concrete soon after at my dad’s farm. We tested all our engines there. It was so cool. We tested hybrids from 5-lb thrust to 1,200-lb thrust. We worked at my home “man cave” two nights a week. That was a magical time. It was also a precursor run for what would become my full-time career and later the founding of a company I called “Orion Propulsion.” That is another story. Anyway, we built a few rockets, and on May 11, 1997, HAL5 made history for amateur rocketry altitude and the world’s first high-altitude ignition of a hybrid rocket. This feat was later recorded in the 2000 Guinness Book of World Records. Here we are 16 years later, and we are looking at another ISDC. We have some great guys running the show like Yohon Lo and Bart Leahy and many more folks making it all come together. Greg is sort of a “gray beard” advisor these days. The theme for this year’s ISDC is “From the Ground Up . . . How Do we Get There?” I’m looking forward to that conference being in the Rocket City this year! The theme pays tribute to Huntsville’s journey from humble beginnings as a cotton town all the way to its current “Rocket City” status. I am looking forward to seeing a successful ISDC 2011 in Huntsville. I am also looking forward to seeing what cool ideas and projects could be offshoots from such an energetic event. 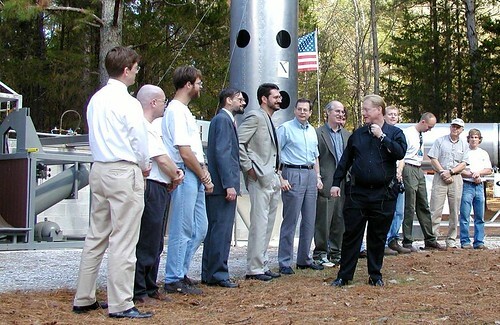 HAL5 Team Members at Project HALO Test Site in 2003. After the nail-biting rocket launch of our Dynetics FASTSAT (Fast, Affordable Science and Technology SATellite), we were all ready for a little R&R. FASTSAT was Dynetics’ major investment into the world of satellite design and manufacturing. We had several experiments onboard from different customers. The launch and deployment have thus far been amazing. We are now settled back in from the Thanksgiving holidays. It was good to get away for a few days to Chicago to visit friends and go shopping with family at the huge Macy’s downtown, despite the fact that I was sick. It gave me a lot of time to think about how tough of an economy we are in and the fact that new sponsorships will not come easy for our Google RCSP effort, and we will really have to be creative and effective to bring in funding. We have got some great talent at Dynetics working on the new RCSP website. It will offer all the bells and whistles. We will have much new content that so many folks from across the company have been contributing. We have been amazed at the interest this project has generated! Stay tuned! Wednesday brought the amazing launch of Falcon 9, America’s first commercial launch vehicle capable of taking cargo and maybe even human passengers to orbit and ISS sooner rather than later. My hat is off to Elon Musk, Tom Mueller, and the entire SPaceX Team. Having worked in the periphery of the launch vehicle world over the last 16 years, and heavily in all areas of propulsion, I can assure you that this was no small feat for the money and time spent developing these incredible technical marvels. These guys are truly amazing, and their success is no fluke. In case you have not heard, this is the rocket we are riding on to take our RCSP Google X PRIZE entry to the moon. We are offering to carry others as well to help pay for our ride.These guys are making America competitive again in the launch business! Congratulations, Team SpaceX! On another cool note, we had an amazing opportunity to go to the Boys & Girls Club in Triana, Alabama, which is on the outskirts of Huntsville. Several of the RCSP team members visited the Club, which has an after school program for students from elementary to high school. Alan Harmon of Dynetics, who volunteers with the Club through the Madison Rotary Club, asked us to share some experiences with the students. We loaded up our high-tech toys and set out to show the children what rocket science is all about. We have a portable venue, which includes a rocket engine that runs on laughing gas and plexiglass (fuel), a helicopter drone that is flown with the iPhone via a direct wifi connection, and a scooter with a real jet engine. We started the day with the suitcase hybrid rocket engine test. We covered the basics of what makes sustained combustion possible, the three key ingredients. The kids answered the hard questions. They gave us a big countdown . . . and the igniter fizzled. Within two minutes, we had recycled back through, and the kids did another countdown which resulted in a loud engine firing that burned for about 10 seconds, producing a bright yellow flame with mach diamonds visible. The children really liked it. It was cool and loud! They asked us to do it again. We were out of fuel, so we went on to the next venue. We decided it was time to show them a scooter that looks like one some of them have in their own homes, I am told, except on the back end, it has a jet engine mounted to it. It has an electric starter, and it took a while to get it going in the cold winter breeze. We finally did get it spooled up, and it was screaming! It produced about 28 pounds of thrust as I rode it down 6th Avenue in downtown Triana. The kids said they had heard jets passing over the town, but never on the street and in town. Once I made a couple of 10-mile-per-hour passes in front of the Boys & Girls Club facilities, I shut the engine off and “safed” the system so the children could see it up close. Several of the kids climbed on deck as I pushed them up and down the road. It was fun. After the cold outside activities, we all went in to the gym and I gave a presentation of who our RCSP team is and why we are going to the Moon with a Rover. We covered the Russian and American Space Race, and where we are today as far as manned missions are concerned. The children asked several questions, and it was obvious they knew a lot about space. We showed off the cool Lander model the Huntsville Center for Technology high school students built for us – students just like them. I showed the youngsters cool videos from home projects from my daughter, friends, and other enthusiasts of space and rockets. They seemed to really enjoy the videos. Once the presentation wrapped up, we flew my AR Drone Helicopter. It uses the iPhone as the camera display as well as the controller. It is just like flying a video game. Many of the children have video games, so I let some of them take control and fly the drone through the gymnasium. The children did an amazing job. They had no close calls or incidents. I was the only one in the almost empty gymnasium to land the drone in the Christmas tree! My hat is off to these youngsters! All and all, I think all of us kids had a really good time, and hopefully we inspired and recruited some new future engineers, scientists, and technicians. Tim Pickens, RCSP team leader, demonstrates his jet-powered scooter for the students at the Triana Boys & Girls Club during an educational visit this week.